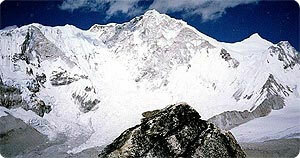 Baruntse Peak lies in the heart of the Khumbu massif to the west of Makalu. This captivating ridge is surrounded by some of the most famous peaks of the world: Everest, Lhotse, Ama Dablam and the list continues. Baruntse is the most accessible 7000-meter peak in the region besides having a normal route of ascent, which can be guided. The first to make its summit were the already famous Hillary and Jim McFarland. The ascent route is through the southern ridge overhanging the famous West pass; this is in act the traditional route opened by Hillary and Shipton in 1952. The regular approach begins at Lukla and takes you across the Hongu valley, one of the most fertile regions in Nepal, passing northward through a beautiful alpine environment. The walk passes through delightful Sherpa country and provides for excellent acclimatization. The Baruntse base camp is at an altitude of around 5400m and sits near the pristine lakes below Amphu Labtsa pass. The route then follows a long ridge leading to the summit. An ascent on Baruntse is an adventure for climbers wishing to meet a true Nepalese 7000 meter. It would be easy for you if you have your own group if not also we can arrange a group trek according to your request. You would be joining the group in Kathmandu. If you want to have a solo trip then we are always ready to help you again with single supplement charge. We try our best to make your comfortable holiday in the beauty of Khumbu region. Climate in Nepal is diversified depends on season. From the low level to highest point of the World, it starts from hot to cold region from South to North. You can travel Nepal in any season but the best time to visit in Khumbu region is autumn & spring. If you are in autumn the weather is perfect and sky is crystal clear but in spring the weather seem little cloudy but the full blossoming Rhododendrons are awesome. In Summer visibility is poor and there is less chances to see the himalayas and in winter it is very cold in mountain but still possible to do this trip. While you travel Khumbu region, you need to obtain the entry permits and TIMS permit. All the applicable permits and entry fees are including on the given cost except personal contribution and donations. In case of extra charge and payment, the agency will inform you. NEAT is highly aware with Environmental concern and keep right ecological system. There shouldn’t be awful impact while you travel around the Khumbu region. So, we involve some campaign of cleaning trekking trails, works with KEEP project etc.